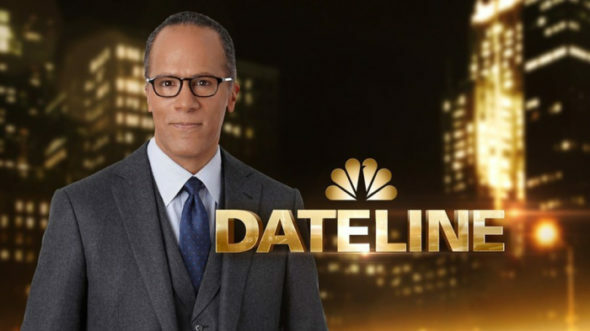 Dateline NBC: Cancelled or Renewed for Season 27 in 2018-19? What’s the story? Has the Dateline TV show been cancelled or renewed for a 27th season on NBC in 2018-19? The television vulture is watching all the latest cancellation and renewal news, so this page is the place to track the status of Dateline NBC season 27. Bookmark it, or subscribe for the latest updates. Remember, the television vulture is watching your shows. Are you? A news magazine airing on the NBC television network, Dateline is anchored by Lester Holt. Correspondents include Andrea Canning, Hoda Kotb, Josh Mankiewicz, Keith Morrison, and Dennis Murphy. The series covers stories ranging from mysteries to documentaries and in-depth investigations. The Friday editions of the 26th season of Dateline NBC is averaging a 0.78 rating in the 18-49 demographic and 4.48 million viewers. Compared to the Friday episodes of season 25, that’s down by 13% in the demo and down by 2% in viewership. The Sunday editions of the 26th season of Dateline NBC is averaging a 0.60 rating in the 18-49 demographic and 4.00 million viewers. Compared to the Sunday editions of season 24, that’s down by 37% in the demo and down by 22% in viewership. The Monday editions of the 26th season of Dateline NBC is averaging a 0.77 rating in the 18-49 demographic and 4.31 million viewers. Find out how Dateline stacks up against other NBC TV shows. Dateline has been renewed for a 27th season which premieres September 28, 2018. Stay tuned for further updates. With a long-running news program like this, cancellation is far less likely than changing up the anchor and/or correspondents or otherwise shaking up the format. I feel confident Dateline: NBC will be back next year. Subscribe for free updates on any Dateline NBC cancellation or renewal news. 5/13/18 update: NBC has renewed Deadline for a 27th season. Details here. 6/19/18 update: Deadline season 27 premieres on NBC on Friday, September 28, 2018. Details here. TV show ratings are still important. Follow Dateline‘s weekly ups and downs. Check the rankings for all of NBC’s current TV shows. Find more Dateline NBC TV series news or other NBC TV show news. Explore the NBC status page and other TV show status pages. What do you think? Are you glad that NBC has renewed its Dateline TV show for season 27? What would it take for them to actually cancel this news magazine TV series? More about: Dateline, Dateline NBC, Dateline: canceled or renewed?, Dateline: ratings, NBC TV shows: canceled or renewed? America’s Got Talent: Is the NBC TV Show Cancelled or Renewed for Season 14? Friday TV Show Ratings: Shark Tank, ANTM, 20/20, Dateline, & What Would You Do? I love the show! It’s hilarious to see how all the different age groups act on a first date. Some of the things people do, amaze me. Please, please renew it for another season!!!!! I’m 56, widowed and trying to navigate this crazy new dating world and I enjoy watching others go through it.